Erasmo of Narni (1370 – January 16, 1443), better known as "Gattamelata", (The nickname means "The Honeyed Cat") was among the most famous of the condottieri or mercenaries in the Italian Renaissance. He was born in Narni, and served a number of Italian city-states: he began with Braccio da Montone, served Pope and Florence equally, and served Venice in 1434 in the battles with the Visconti of Milan. 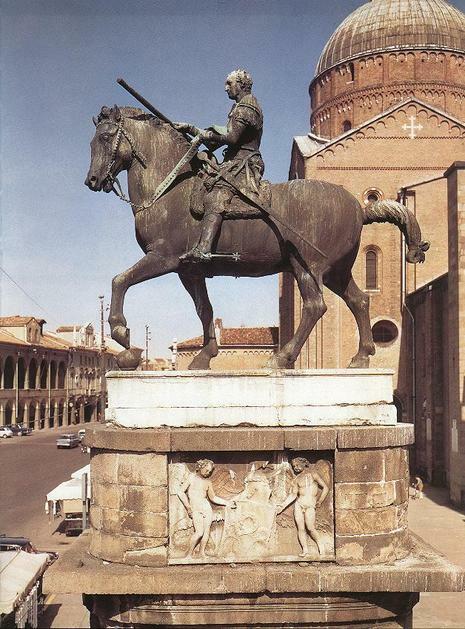 He was the subject of Donatello's equestrian bronze sculpture in the main square of Padua, the same city over which he became dictator in 1437. In Narni, the farmhouse in which Gattamelata was born bears a plaque reading "Narnia me genuit Gattamelata fui — (I was born in Narni, I was Gattamelata)." 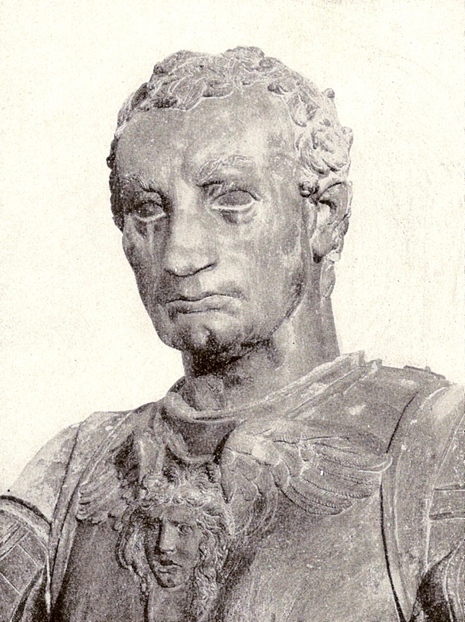 In 1443, when Donatello was about to start work on two much more ambitious pairs of bronze doors for the sacristies of the cathedral, he was lured to Padua by a commission for a bronze equestrian statue of a famous Venetian condottiere, Erasmo da Narmi, popularly called Gattamelata (The Honeyed Cat), who had died shortly before. Such a project was unprecedented - indeed, scandalous - for since the days of the Roman Empire bronze equestrian monuments had been the sole prerogative of rulers. The execution of the monument was plagued by delays. Donatello did most of the work between 1447 and 1450, yet the statue was not placed on its pedestal until 1453. It portrays Gattamelata in pseudo-classical armour calmly astride his mount, the baton of command in his raised right hand. The head is an idealized portrait with intellectual power and Roman nobility. This statue was the ancestor of all the equestrian monuments erected since. Its fame, enhanced by the controversy, spread far and wide. Even before it was on public view, the king of Naples wanted Donatello to do the same kind of equestrian statue for him. In 1443, when Donatello was about to start work on two much more ambitious pairs of bronze doors for the sacristies of the cathedral, he was lured to Padua by a commission for a bronze equestrian statue of a famous Venetian condottiere, Erasmo da Narmi, popularly called Gattamelata (“The Honeyed Cat”), who had died shortly before. Such a project was unprecedented—indeed, scandalous—for since the days of the Roman Empire bronze equestrian monuments had been the sole prerogative of rulers. The execution of the monument was plagued by delays. 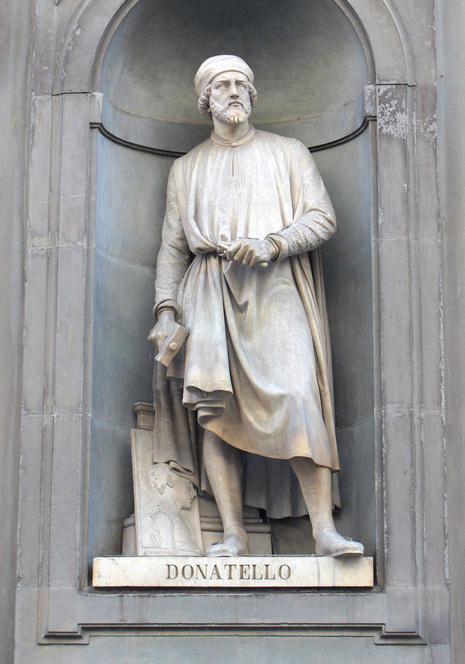 Donatello did most of the work between 1447 and 1450, yet the statue was not placed on its pedestal until 1453. It portrays Gattamelata in pseudo-classical armour calmly astride his mount, the baton of command in his raised right hand. The head is an idealized portrait with intellectual power and Roman nobility. This statue was the ancestor of all the equestrian monuments erected since. Its fame, enhanced by the controversy, spread far and wide. Even before it was on public view, the king of Naples wanted Donatello to do the same kind of equestrian statue for him.